This is the part of our trip that I’ve been fearing the most: we’re in China. We crossed the border from Macau to Zhuhai this morning to catch our bus from Zhuhai to Guangzhou. The bus – a CTS coach – was super-comfy with over-sized leather seats, no blasting music and air-con at a comfortable temperature. If this is a fair example of coach travel in China, I predict more coaches than originally planned in our future as we travel across China. The map above summarizes our intended itinerary. From Guangzhou we’ll be spending a couple of days in Northen Fujian province just to break the journey between here and Shanghai into more managable chunks (i.e. no more than 12-14 hours on a bus or train between stopping points). Then we plan to visit popular tourist spots such as Shanghai, Nanjing, Beijing and Xian before heading west on a more lightly-traveled road loosely following the path of the ancient Silk Road. Although, the stretch between Chengdu (yes, we plan to go see the Pandas ) and Lanzhou, the Hexi Corridor, will give us a taste of Tibet as we cross the Northern edge of the Tibetan plateau. – The Metro is clean and efficient. Signs had English translations and all announcements are also made in English – this was a welcome surprise. – I’ve worked in technology for all my working life but it’s only now, on entering China where my highschool French and German can’t help me in any way, that I really appreciate the benefit of on-the-fly translations and touch-screen technologies in ATMs and automatic ticketing machines. – Starbucks and 7-Eleven on every corner are easy signs of globalization but my favorite oddity (from today) is an advertisement on a Guangzhou local bus for a garment trade fair in Chinese, Arabic and English. – The train station was a zoo and the lack of a central ticketing agency meant that the first available tickets to Xiamen were on tomorrow’s train so we’re having to spend a night in Guangzhou – which wasn’t on the original plan. But the young PLA officer who stopped to chat with Murph, then disappeared and subsequently reappeared just to help translate for us and help with our ticket-purchasing transaction was, I thought, a special person-to-person welcome to China. 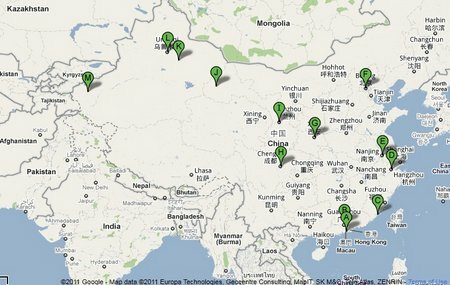 This entry was posted in China, International Escapades and tagged China on April 8, 2011 by wandermom.